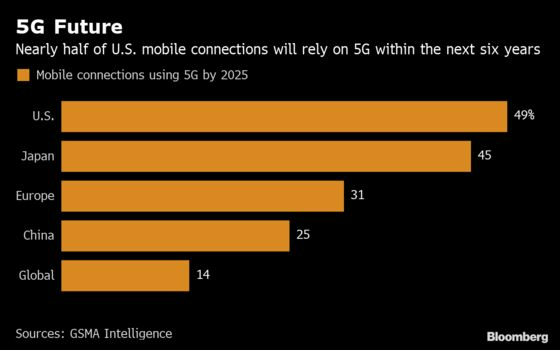 (Bloomberg) -- Now that the first 5G devices are hitting the U.S. market, Apple Inc. is under more pressure to start readying a comparable iPhone — or watch its dominance come under attack. Already, Motorola Mobility Holdings has a quasi-5G phone out — it requires a snap-on module — and Samsung Electronics Co. will start selling its own version through Verizon Communications Inc. on April 18. LG Electronics Inc. is planning to launch one at Sprint Corp. “very soon” and is trying to accelerate the rollout of a model for Verizon, aiming to capitalize on the frenzy surrounding the ultrafast network technology. In fact, all the big U.S. handset sellers have shown, announced or launched 5G devices. 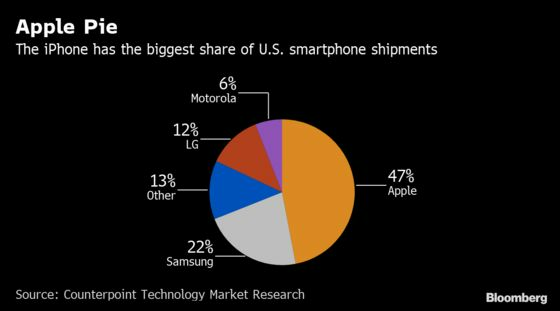 All except Apple, the industry leader that accounts for nearly half the smartphone shipments in the U.S. The company isn’t expected to release a compatible iPhone this year, and even 2020 isn’t a sure thing. It’s hard to gauge the risk for Apple if it’s a laggard in the 5G race. The company smoothly navigated relatively late transitions to 3G and 4G, though that was when the iPhone was still the hot new thing. 5G networks also still have to be built out, and the wireless signals are prone to interference. It’s no sure thing that consumers will embrace 5G by 2020, regardless of what Apple does. The early 5G phones will potentially be pricier and bigger than some of their slower counterparts, a short-term drawback to the technology. Complicating matters is a bitter legal battle with Qualcomm Inc., the biggest maker of key 5G chips. Apple has challenged Qualcomm’s patent-licensing practices, and the case is slated to go before a jury in San Diego later this month. Verizon, the biggest wireless carrier in the U.S., expects to have 5G in 30 cities by year-end. AT&T Inc. and Sprint also are in the early stages of their rollouts. “That would be very concerning for Apple because the U.S. market is already not growing,” he said.